Venue: LTG auditorium, Copernicus Marg, Mandi House. The city of Mir Ahmed Ali, who invented the legend of Hoshruba. The city of Muhammad Ali Khan who brought alive Ayyaari in his narrative. The city that saw the master Dastangos like Muhammad Husain Jah, Ahmed Husain Qamar and Amba Prasad Rasa. That Nakhlau beckons its own child - Dastangoi. 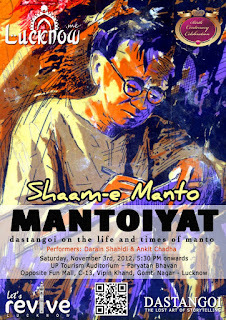 makes its premiere at Dastangoi's Headquarters. Here's a great example of how stories travel. 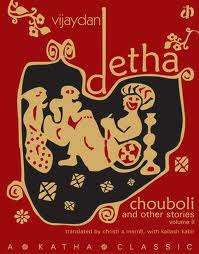 A storyteller in Rajasthan told a folk tale to Vijaydan Detha. The latter wrote the story in Rajasthani. An American scholar, Christi Merrill translated the story into English, which got published in this book. Mahmood Farooqui referred to this version of the story and put it back to life by retelling it in a once-lost art form of Urdu storytelling - Dastangoi. Now, Merrill and Farooqui meet. They read out their versions and engage with the process of storytelling to text to storytelling. Studio Safdar is a small space with limited seating, so best to arrive early. The event is not ticketed.